Allegations of land encroachment made by Ile-Ife against Modakeke may be leading to another round of communal clashes in Osun state. 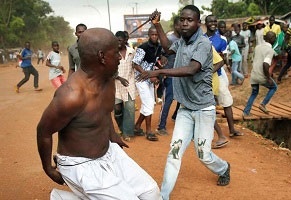 For those aware of the bitter acrimony between Ile-Ife and Modakeke people in the past, leading to the Ife-Modakeke communal clashes in the late 90s, there are reasons to be worried again. Fresh allegations of conflict between youths of the two communities call for serious attention from the Osun state government. Different youth groups in the two communities are alerting various authorities including the state governor, Rauf Aregbesola and security agencies to urgently intervene in an impending fresh crisis between them. And it all borders on allegations of land encroachment made by Ile-Ife against Modakeke. Youth groups in Modakeke have now petitioned Governor Aregbesola, and security agencies in the state to intervene in a fresh crisis brewing. Their petitions followed another letter written by some Ife youths under the aegis of the Ife Youth Vanguard and Great Ife to the governor, wherein they accused the traditional ruler Ogunsua of Modakeke, Oba Francis Adedoyin, and residents of the town of encroaching on land belonging to Ife people. According to the youths, this violates the 1999 Peace Agreement reached between the two communities to end the Ife-Modakeke War. The tone of the letter which seems more like a threat of violence prompted the two Modakeke youth groups; Modakeke Youth Movement (MYM) and the Modakeke Progressive Union (MPU) to separately seek the governor’s intervention. The MYM in the letter signed by its Chairman, Femi Ojeleye and General Secretary, Seyi Oloke, described the allegations of the Ife youths as false. They said that neither the Modakeke monarch nor the people had violated any of the 1999 Peace Agreements. “If Ife youths have anything against our Oba, instead of threatening violence, they should seek redress in the court. “It is important to state here that there has never been a time when Modakeke engaged in any action capable of breaching the 1999 Peace Agreement as alleged by the groups. “It is our suggestion that Ife youths should come to the open and name any section of the peace deal that has been violated by Modakeke people as they claimed. “Modakeke people are peace loving and we will continue to promote peace in Ife land because the present Ooni of Ife, Oba Enitan Ogunwusi Ojaja II is a man of peace. “We do not want this matter to die like this. So, we therefore humbly call on you (governor) to bring these Ife youths to book,” the Modakeke youths said. The Modakeke Progressives Union, in a letter signed by its National President, Mr. J. O Odegbemi and National Secretary, Alhaji O. A Akinwale, also asked the governor to bring the Ife youths, who allegedly threatened violence, to book.